CONNECTICUT FRATERNAL ORDER OF POLICE “TEAM – UP” WITH ATHLETES FOR AMERICA. BECOMES FIRST FOP IN UNITED STATES TO ENDORSE THE AFA NATIONAL EMERGENCY PREPAREDNESS INITIATIVE. Danbury, CT – The Connecticut Fraternal Order of Police has become the first FOP in the United States to endorse the ATHLETES FOR AMERICA national initiative to build America’s largest civilian emergency preparedness network led by athletes. Connecticut State Fraternal Order of Police President John Flynn said “ The Connecticut Fraternal is honored to support such a great cause. We believe in the ATHLETES FOR AMERICA mission and look forward to working with them to achieve their goals”. ATHLETES FOR AMERICA is a growing National Civilian Emergency Preparedness Network networking with every level of athlete, coaches, Universities, Colleges, High Schools, sports teams, organizations, leagues and associations in communities all across America that are committed to promoting and participating in emergency preparedness educational and training programs (CPR, AED, First Aid and CERT) so that our nation will be better prepared for any type of natural, man-made or day to day emergency. AFA Founder Billy McGehee said “I am honored that the Connecticut Fraternal Order of Police has chosen to endorse the AFA National Emergency Preparedness initiative. Having the opportunity to work with the 1,200 plus professional men and women that make up the Connecticut Fraternal Order of Police is fantastic! Hopefully, with their support more FOP’s across America will also team-up with AFA. It is extremely important to our mission to be able to work in partnership with these professional first responders in communities all across our Country. I believe Athletes will begin to understand the importance of working with and learning from these professionals. I am extremely proud to have the Connecticut Fraternal Order of Police as the first FOP in the United States as our Partner”. 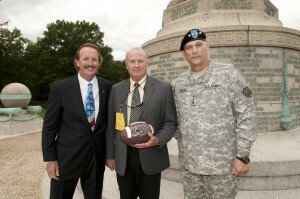 September 10, 2010 to Launch the Athletes For America National Emergency Preparedness Tour. "In keeping with the demands on junior officers in our Army and our long-standing commitment to building leaders of character dedicated to selfless service, West Point requires all of its 4,500 cadets to be physically fit, to sharpen their athletic abilities "upon the fields of friendly strife," and to be trained extensively in emergency first aid. Along with the other vital skills of a leader in today’s Army that we develop here at West Point, we believe that participation in high quality athletic competitions and first responder training make our graduates ready to react positively and constructively in times of an emergency. I strongly believe that every adult, in or out of the military, can be of greater benefit to society with the skills and values instilled by athletic competition and first aid training. It is my hope that other colleges and organizations join in this endeavor."